Enhancing women‟s capacities and developing their potentials is of central importance. 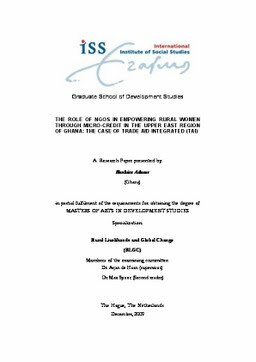 This paper examines the role of NGOs in empowering rural women through microcredit in the Upper East Region of Ghana. Its focus is on the programmatic intervention of Trade Aid Integrated (TAI), a local gender-progressive NGO whose objective is to empower vulnerable women economically by providing them microcredit to engage in various microenterprises, especially basket weaving and others. In spite of the great contribution of women to socio-economic development within and beyond the family, they are largely barred from access to and control over productive assets as well as equal participation and influence over household decision making. This is mainly due to socio-cultural norms and gendered institutions that relegate them to dependency and push them to the periphery in all sphere of life. Thus, TAI believes that, the economic empowerment of women in the Bolgatanga and Bongo districts in the Upper East Region of Ghana will lead to empowerment in other areas such as access to and control over resources, better influence in major family decision making as well as better bargaining power in intra-household gender relations. Findings from this study shows that TAI's microcredit scheme has to some extent empowered the women economically as it has improve their welfare/livelihoods by giving them employment and income. It has also increased their assertiveness and confidence level, self-worth and given them some level of freedom of movement to transact their businesses as well as some respect from their husbands. However, the programme has little or no effect on the existing socio-cultural norms, traditional practices and gendered institutions that continue to marginalize, exclude and subordinate women in all facets of life. This is because, women can only control their loans and self-acquired assets from their income, but they still do not have access to and control over major household assets such as land, cattle among others. These are still “men‟s domain”. They also have little influence in intra-household bargaining and independent decision making within the household. Relevance to Development Studies Development is about meeting the needs of those most in need, the marginalized, especially women. Effective development policies and strategies can bolster the informal non-farm sector leading to socio-economic empowerment of the poor and deprived, particularly women. Empowered women can contribute better to the progress and development of the family and society at large. Thus creating enabling conditions for women to gain freedom from discrimination and marginalization and to make strategic life choices is vital. This means addressing women‟s felt needs by alleviating poverty, increasing gender equality and empowerment of women through programmatic intervention schemes such as microcredit.